Trainer Mark Casse’s locally-based assistant Nick Tomlinson is eagerly awaiting Saturday’s $100,000 Commonwealth Turf (Grade III) as his “barn favorite” March to the Arch tries for his first graded stakes win at Churchill Downs. March to the Arch, a homebred from Charlotte Webber’s Live Oak Plantation, has reeled off three victories through nine starts in his career, including a 1 ¾-length score in the $100,000 Toronto Cup at Woodbine in late July. Jockey Julien Leparoux has the call on the gelded son of Arch in the Commonwealth and will break from post position No. 4 as the 5-2 second choice on the morning line odds. March to the Arch began his career in South Florida at Gulfstream Park where he broke his maiden at second asking. The Florida-bred most recently finished fourth in the Hill Prince (GII) at Belmont Park and third in the Saranac (GIII) at Saratoga. The Commonwealth, run at 1 1/16 on the Matt Winn Turf Course for 3-year-olds, is carded as Race 10 of 11 with a post time of 5:36 p.m. (all times Eastern). First post Saturday is 1 p.m. The complete Commonwealth Turf field from the rail out (with jockey, trainer and morning line odds): Reride (Florent Geroux, Steve Asmussen, 4-1); Marzo (Albin Jiminez, Ben Colebrook, 12-1); Sniper Kitten (Tyler Gaffalione, Mike Maker, 7-2); March to the Arch (Leparoux, Casse, 5-2); Year of the Kitten (Corey Lanerie, Maker, 15-1); Zero Gravity (Adam Beschizza, Joe Sharp, 8-1); and Hot Springs (Ricardo Santana Jr., Steve Asmussen, 2-1). CHURCHILL DOWNS RACING CLUB BACK IN WINNER’S CIRCLE WITH RARE FORM – The Churchill Downs Racing Club silks were donned in the winner’s circle for the 10th time Thursday when 3-year-old Rare Form recorded a front-running 2 ¾-length score in a 6 ½ furlong maiden special weight at Churchill Downs. Rare Form was donated to the Churchill Downs Racing Club by Spendthrift Farm’s B. Wayne Hughes and the majority of his purse earnings will be donated to the City of Hope Pediatric Cancer Research Hospital in Los Angeles. The Churchill Downs Racing Club was inaugurated in 2016 to give horse racing fans an insider’s look at horse ownership. To date, more than 50 club members have joined other ownership groups, according to Palmisano. The eight horses that have competed under the Churchill Downs Racing Club banner have earned $995,366, led by Grade III winner Warrior’s Club’s $724,104. DOWN THE STRETCH – Racing at Churchill Downs continued Friday with a first post of 1 p.m. (all times Eastern). There is an $81,493 carryover in the 20-cent Single 6 Jackpot that begins in Race 5 at 3:03 p.m. … Join Churchill Downs Racetrack’s Darren Rogers and Kevin Kerstein for “Inside Churchill Downs” Friday at 6 p.m. on ESPN 680/105.7. The one-hour penultimate show of the year will feature NBC’s Randy Moss to look back at last weekend’s memorable Breeders’ Cup World Championships. To listen live, visit www.espnlouisville.com. … There will be a Veterans Day celebration Sunday at Churchill Downs where active and retired military members are invited to enjoy a day at the races with free general admission or a discounted $29 ticket price for Millionaires Row. To purchase tickets, contact groupsales@kyderby.com or call 502-636-4450. 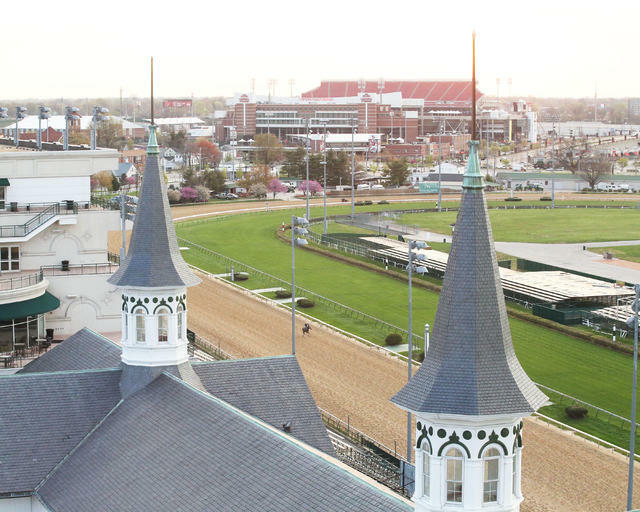 … The first 5,000 fans on Sunday will receive a free 2019 Churchill Downs wall calendar sponsored by Humana. For more information, visit: https://www.churchilldowns.com/calendar/2018-11-11. … Churchill Downs all-time leading trainer Dale Romans is on the cusp of 2,000 career wins. The South Louisville native entered Friday with 1,995 wins and has six entries on Friday-Sunday.